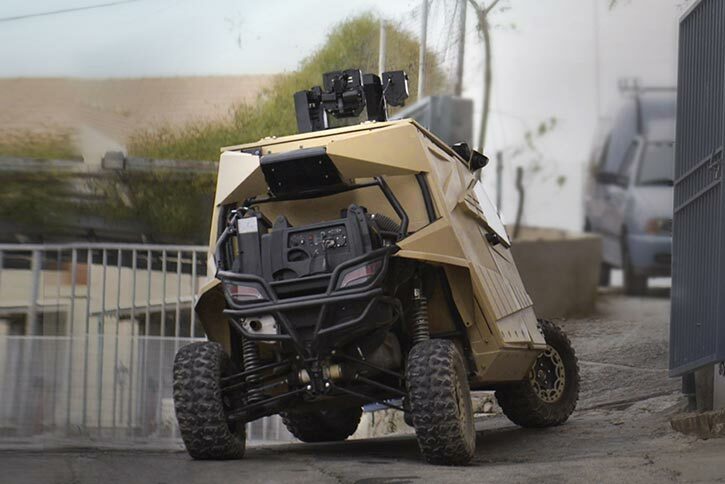 Plasan unveiled today it’s all-new, lightweight protected vehicle – Yagu at Expo Seguridad event in Mexico City this week. 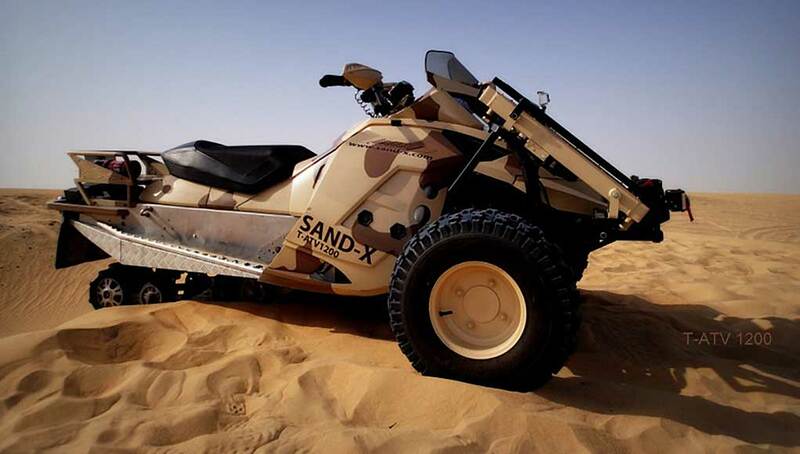 In fact, plasan transformed the 767 kg commercial Arctic Cat Wildcat 4 1000 four-seat all-terrain vehicle into a 1.48-ton (dry weight) fully-protected assault vehicle. 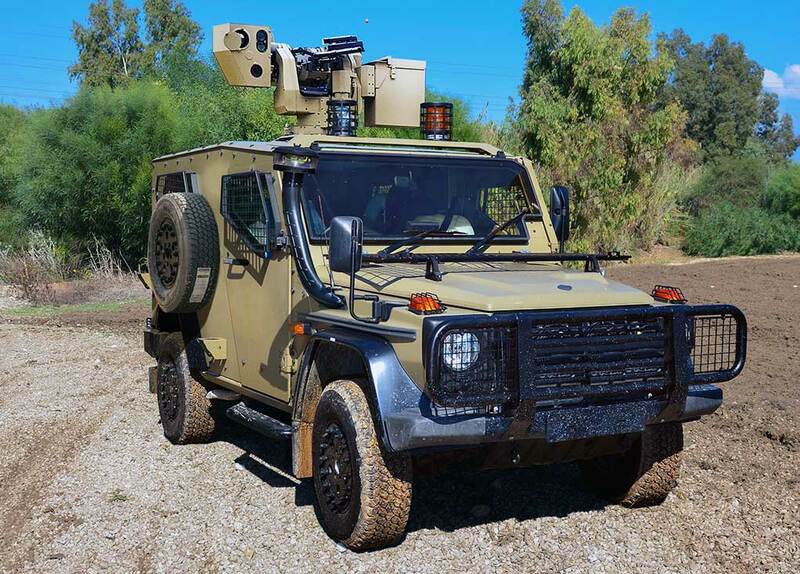 The vehicle is designed to behave like an All Terrain Vehicle (ATV) but offers its crew of three persons the all-around 360 ballistic protection at a level of B6+ (similar to STANAG 4569 Level II) effective against 5.56X45, 7.62X39 and 7.62×51 threats. 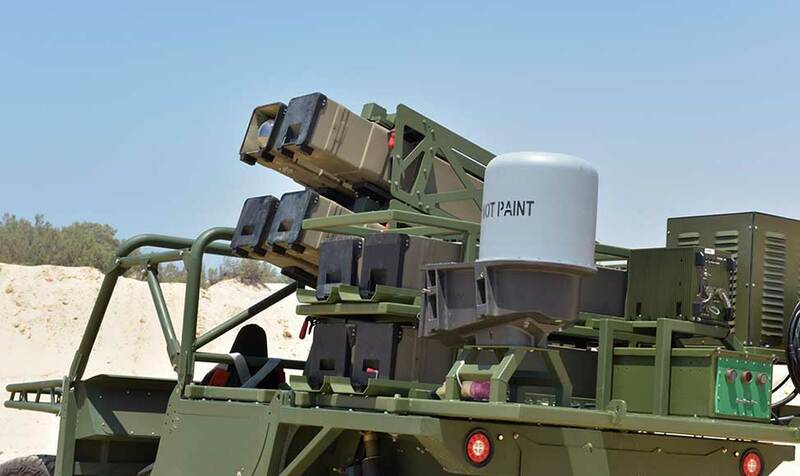 WIth front and side windows and all-round cameras the protected capsule provides excellent situational awareness and response, using an overhead ultra-light remotely operated weapon, that mounts a 5.56 or 7.62 machine gun and EO sensors operated by the crew from within the air-conditioned, armored capsule. 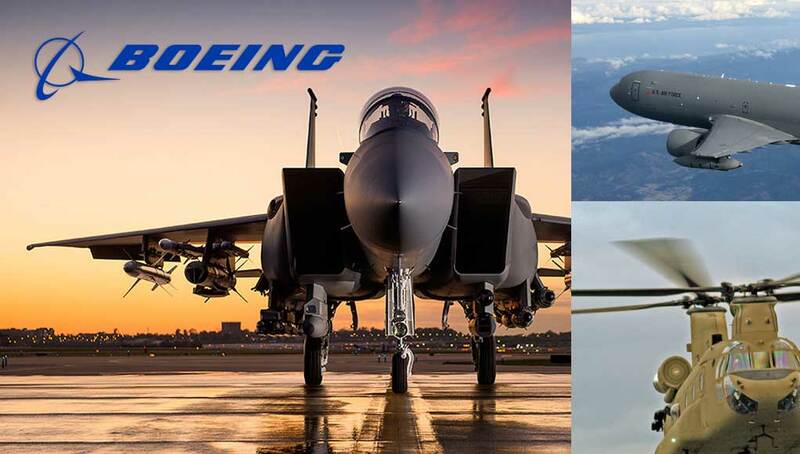 The vehicle can also be equipped with a drone launching system, that can operate airborne for 27 minutes. With automatic target tracking features the drone provides enhanced situational awareness for the crew. 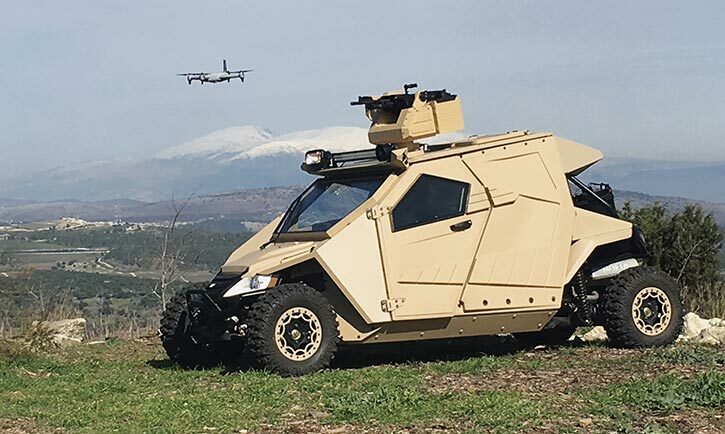 The air-transportable Yagu is positioned to meet the needs of special operations, border patrols, urban warfare as well as special missions in crime-fighting, where light and agile platforms are required. According to Plasan, Yagu provides such high protection level at an exceptionally low weight. 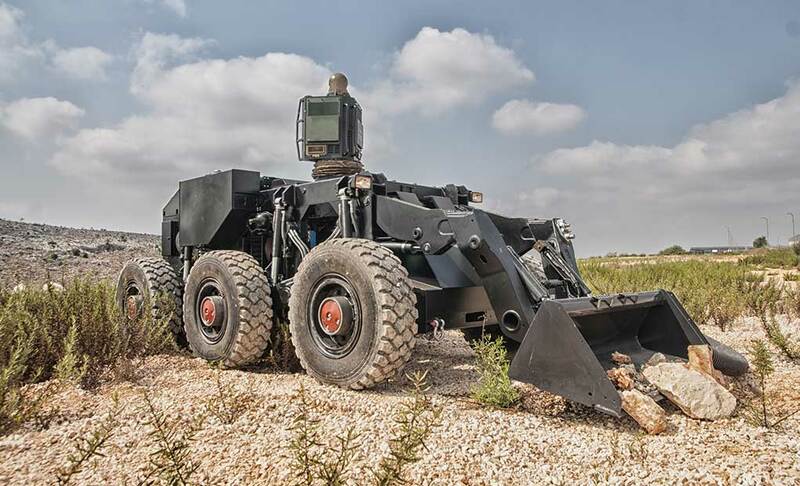 As its outdoors sibbling, Yagu can move on rocky and muddy terrain, on sand dunes and in forest environments, climbing extreme sloping roads. In urban scenes Yagu’s compact size comes handy, as it is able to move through narrow passages (its width is merely 162 cm), crossing jammed or blocked roads on sidewalks and stairss. 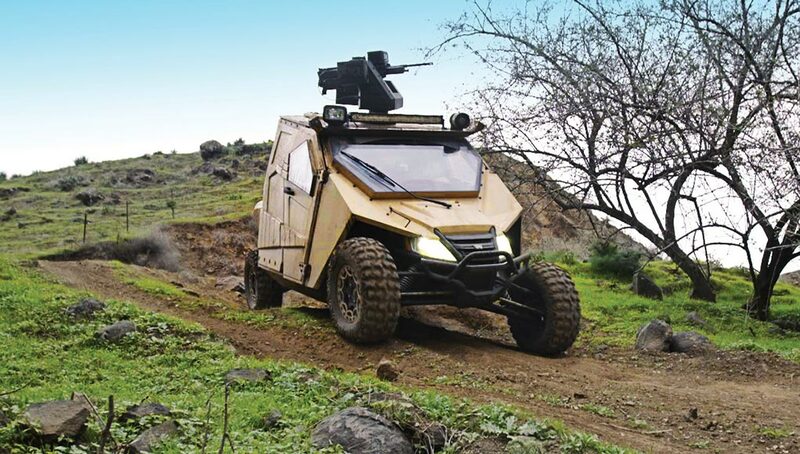 Even with full armor, three fully equipped troops and 350 kg payload (a gross vehicle weight of more than five tons! 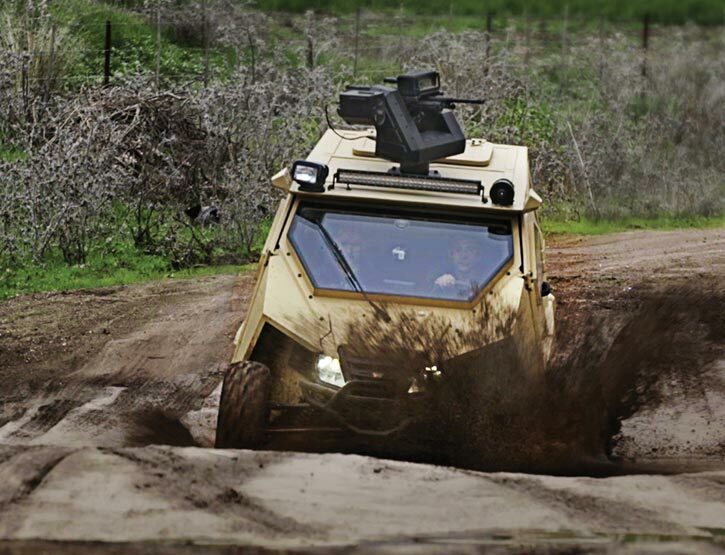 ), Yagu maintains a power/weight ratio in excess of 53 HP/Ton, thus maintaining much of the agility and mobility of the Wildcat. The platform retains the original 1000 H2 V- Twin, S0HC 4 – stroke, 4 – valve w/EFI 951cc engine with electronic fuel injection, coupled to an automatic transmission with HI/LO gear, 2 or 4 wheel drive and the long-travel front and rear suspension used in the original Wildcat. To support the added weight and improve mobility, Yagu uses bigger tires (28 X 10r14 instead of the civilian version’s 26x9R14 and 26x11R14). In addition to the powerful 95HP engine Yagu also has an independent power generator and integral air condition systems, maintaining continuous electrical power for the mission systems and comfortable climate inside the protected crew capsule. Photo: Plasan.